Vintage Reserve International & Juice It Up fresh juice for wine. Our Vintage Reserve and Juice It Up fresh juices are sourced from only the finest international vineyards of the world. Wines should not be stored at room temperature. In order to preserve the integrity of the wine, ideal storage temperature should be 10 C of 50 F.
Make your own Award Winning Wines! Improve the aroma, bouquet, and tannins in your Red Wines by adding some grape skins. Alicante creates wines that are dry and dark red in colour. This variety produces heavy red wines that are traditionally used for blending. Traditional Food Pairings: Alicante is known for matching well with rice, chicken, shellfish and salad. Also known as the fourth biggest seller in Italy, Amarone is unique to the Valpolicella region of Italy. Amarone grapes produce rich, full-bodied wines that are ruby purple in colour. In addition, Amarone produces many different types of flavours, including raspberry, blackberry, cassis, licorice, tobacco and figs. Furthermore, Amarone can create a very bitter style of wine or a rich, dry, intense wine bursting with chocolate, dried fruity aromas and a long, bitter almond finish. Because of its magnificent characteristics, Amarone can be enjoyed young; however, it is much preferred once it has been aged for a few years. Oak Aging Recommended. Optional: In Store Winemaking Price $114.00 + tax. Traditional Food Pairings: Amarone is best enjoyed when it is paired with roasted beef, pork and ripe cheeses. Barbera is considered one of the most famously grown grapes in the Piedmont region of Italy. Throughout the 1890’s, Barbera was regularly served as a table wine. Interestingly enough, Barbera is not only known as a quality varietal wine grape, but it is also known as a blend. In addition, Barbera grapes usually produce incredibly mouth-watering, dry red wines that simply cry out for food. They are low in tannins, high in acidity and produce aromas of sour cherries, plums and herbs. Traditional Food Pairings: Because it is not a shy wine, Barbera is paired well with most Italian dishes, such as antipasto, olives, cheeses, pasta and roast chicken. Barolo grapes are grown in Italy’s Piedmont region, which consists of many other famous varieties. Because it is deep in colour and rich in flavour, Barolo is considered to be a wine with complex and wild aromas of cherries, chocolate, violets and truffles. Oak Aging Recommended. Traditional Food Pairings: Barolo, matching well with spicy, deep-flavoured foods, can be easily enjoyed with steak and prime rib. Cabernet Franc is usually grown in the Bordeaux region and is occasionally used in Bordeaux blends to add acidity and aroma. This type of grape is known for its fruitier and lighter wines. For a better taste, Cabernet Franc is occasionally blended with Cabernet Sauvignon. This early ripening grape produces outstanding wines on its own. It can exhibit bell pepper, raspberry and blackberry aromas. Oak Aging Recommended. Traditional Food Pairings: With its amazing flavours, Cabernet Franc tends to pair well with spicy foods, meats, poultry, grilled fish, pasta, steak, meat stews and roast beef. Cabernet Sauvignon is one of the most famously grown grapes in the southwest region of France. Cabernet Sauvignon is occasionally aged for approximately 18 months in tiny oak barrels in order to achieve more complexity. This grape produces a full-bodied red wine that is dark in colour. The flavour is usually enhanced by oaking and tends to be preferred by many when it is aged. Furthermore, Cabernet Sauvignon is widely known for being a mix between Cabernet Franc and Sauvignon Blanc. Oak Aging Recommended. Traditional Food Pairings: Cabernet Sauvignon is known to the majority of winemakers as the ideal food wine. This type of wine pairs excellently with roast turkey, lamb, plain roast, grilled meats and beef stew. Cabernet/Merlot is well known for being an all-season wine. This type of grape is a combination of Cabernet Sauvignon’s aggressive style and the finesse of soft Merlot. The blend of Merlot adds a softer and richer finish to the wine. Oak Aging Recommended. Traditional Food Pairings: Usually, Cabernet/Merlot can be easily paired with prime rib, roast duck, chicken breast and pasta with meat sauce. This Cabernet/Merlot/Shiraz blend captures all of the elegant fruit characters a wine has to offer. The Cabernet provides the flavour, length and structure, with Shiraz imparting a spicy complexity and richness. The Merlot adds the softness which allows you to enjoy this varietal relatively young. Oak Aging Recommended. Traditional Food Pairings: Cabernet/Merlot/Shiraz can be easily paired with lamb cutlets, sausages and veal scaloppini. Cabernet/Shiraz creates a deep red wine with a unique spicy overtone. It is a combination of Cabernet Sauvignon’s structure and Shiraz’s texture. This full-bodied wine is designed to be well oaked and is usually cellared after being bottled. Oak Aging Recommended. Traditional Food Pairings: Cabernet/Shiraz can be easily paired with lamb cutlets, sausages and veal scaloppini. A regional style wine, California Red is full-flavoured without the edge. This grape also creates a dry wine that is medium in colour. Finally, California Red is known for being served early as opposed to being aged. Traditional Food Pairings: California Red is specifically known to pair itself well with rich fish (tuna, salmon), beef, poultry, lamb, pork and veal. Carignane is known for being the most cultivated grape variety in southern France. This type of grape was originally grown in Aragon, a northeastern Spanish province. It is widely recognized as a good, dry wine that is light to medium red in colour. Traditional Food Pairings: Because of its dry characteristics, Carignane is well known to be paired with grilled meats, beef, poultry, Italian pancetta, pizza, pasta, salad and cannelloni with ricotta. Château de la Reine, otherwise known as Châteauneuf-du-Pape, is popular for producing considerably complex styles of wine. This variety produces light to heavy wines that are rich, earthy and spicy. In addition, Château de la Reine produces wine with black cherry flavours. Oak Aging and elderberries recommended. Traditional Food Pairings: Château de la Reine is often enjoyed with beef, pasta and strong cheeses. Chianti usually creates an aggressive table wine that is velvety in taste and texture. Because it is rich in sight and smell, it is known as the ultimate Sangria base. This type of grape is famous in the Tuscany region of Italy because of its full, dry characteristics. Chianti produces wines that are low in acidity and high in alcohol. This wine also produces aromas of cherries, plums, herbs and a hint of tobacco or leather. Finally, these wines can be light, medium or even full-bodied with a good amount of tannin and a touch of bitterness on the finish. Oak Aging Recommended. Traditional Food Pairings: Because of its dry characteristics, Chianti can easily match well with Italian foods such as meats, pizza, pasta and veal. ”Confuzion” or Malbec / Shiraz Blend has a rich nose of dark red fruit – cherries and blueberries – and a decent helping of earthy notes. It’s fairly full bodied and quite soft, with good acidity and tannins. It is slightly fruity overall, with a bit of sweetness and a modest, pleasant finish. Oak Aging Recommended. Gamay is known for its best wines in the Beaujolais region of France. As a result, Gamay has a reputation for creating light and lively low tannin wines with tutti frutti flavours of cherry, strawberry and raspberry. This grape is also known for creating light wines that are best served when they are young and slightly chilled. Traditional Food Pairings: Gamay is well known for being paired with many dishes that contain duck, rabbit or white meats. Gamay Noir is well known for producing bright and tasty wines that are best consumed when young. Furthermore, Gamay Noir creates medium-bodied wines with cherry, strawberry and spicy flavours. Lastly, Gamay Noir is recognized for producing a crisp red wine that is high in acidity. Traditional Food Pairings: Gamay Noir is a wonderful companion to a variety of foods like beef tenderloin, teriyaki, cannelloni, chicken, sandwiches and pizza. Grenache, found in the southern Mediterranean wine region, is one of the most greatly planted wine grapes in the world. This type of grape produces fruity wines that are full in flavour and light in colour. Grenache can also be made into excellent dry rosé wines. Often part of a blend, it has sweet and spicy aromas of raspberry and strawberry. Finally, because it is low in tannin, Grenache generally does not age well. Traditional Food Pairings: Grenache can easily be partnered with barbecued food, roast beef, lamb, grilled sardines and even some vegetarian dishes. Impressively, Grenache/Syrah is a variety that produces light, lively wines. Usually, Grenache/Syrah is a blend of 70% Grenache and 30% Syrah. This blend produces red wines that have strawberry and raspberry aromas. Grenache/Syrah also produces wines that have a spicy, tropical fruity finish. Being a crisp wine, Grenache/Syrah creates wines that are round with well blended tannins. Oak Aging Recommended. Traditional Food Pairings: Grenache/Syrah is known for being paired with cold meats and many French dishes. House Red is specifically known for producing medium-bodied red wines with excellent texture and taste. At the same time, it is extremely adored by many because of its irresistible taste of cherries, red berries and chocolate. Finally, House Red produces black cherry, fruity aromas that lead straight to the nose. Traditional Food Pairings: Most winemakers believe that House Red is greatly enjoyed with salmon, tuna steak, turkey, goose and duck. Definitely known for being an elegant, medium-bodied red wine, Jermillion produces wines that have smooth, soft berry undertones and oaky flavoured touches. In addition, Jermillion is well known for producing hearty and complex red wines. Traditional Food Pairings: Because of its natural falvours, Jermillion can be enjoyed with mushrooms, salmon, spare ribs, roasted lamb and many cheeses. An Italian grape, Lambrusco is known for producing wines that have many different characters. For example, Lambrusco can create wines that are sweet and fizzy or dry, low in tannin, frothy and strawberry-fruited. At the same time, Lambrusco is greatly desired by many because of its bitter twist on the finish. Wine Conditioner Optional. Traditional Food Pairings: Because of its bitterness, Lambrusco can be complimented by certain types of poultry, Mexican food, veal and pasta with tomato and meat sauce. Malbec is known for producing wines with deep colour, ample tannin and complex, plum-like flavours. Popular in Argentina, Malbec also produces young, light wines that consist of fruity, berry-like aromas. Lastly, Malbec is mainly enjoyed when aged for a long period of time. Traditional Food Pairings: Many winemakers enjoy Malbec when it is paired with many different red meats, pasta with tomato sauce and hard cheeses. A great blend of 50% Malbec and 50% Merlot. It is a very satisfying tasting full-bodied red wine. It is dense, dark purple-red in colour with crimson rims and opulent ripe berry fruit aromas. A firmly structured wine with ripe fruit, grippy yet sultry tannins and a long, full-bodied, juicy, rich finish. There’s that intrinsic purple character of Malbec – violets and black plums, with lots of spice. Oak Aging Recommended. Traditional Food Pairings: Malbec/Merlot pairs well with duck and grilled meats. It can also be thoroughly enjoyed on its own at a party. Merlot grapes have been cultivated in the Bordeaux region for centuries. This type of grape produces dry wines that are rich in flavour and ruby red in colour. At the same time, Merlot is velvety smooth and rich in aroma and is preferably enjoyed when it is aged. In most cases, Merlot grapes are often blended with Cabernet in order to shorten the Cabernet Sauvignon’s aging requirement and produce a softer wine. Oak Aging Recommended. Traditional Food Pairings: Merlot is well known for being enjoyed on its own but it can pair itself easily with many foods. Some pâtés, duck and meat casseroles help to make Merlot complete. Montepulciano, from the Montepulciano d’Abruzzo region of Italy, produces dry, smooth and complex wines. This robust, ruby red wine has mild fruit flavours, complemented by oaky and earthy tones. Also, occasional oaking and aging help to enhance the wine’s character. Oak Aging Recommended. Traditional Food Pairings: As a complex wine, Montepulciano d’Abruzzo becomes more complete when paired with pasta, grilled sausages, pizza and many cheeses. Nebbiolo is the grape behind the famous Barolo and Barbaresco wines. These are not beginners’ wines; they pack a powerful punch and it can take years for the grip of the tannins to ease up. Wines that are made from Nebbiolo are usually dark, tannic and alcoholic. Nebbiolo frequently consists of many different flavours, from cherries to licorice and truffles. Lastly, Nebbiolo is very famous for its rich, chewy, deep, long-lasting flavours. Traditional Food Pairings: Because of its extreme popularity, Nebbiolo is especially enjoyed with many rich, strong flavoured meats and stews. In addition, Nebbiolo is known for being paired with many different dry cheeses. Literally “Black Bitter” is a noted variety planted in the Puglia region, the heel of Southern Italy. Made from very old bush vines, which produce grapes with low yields and good concentration. This variety is normally blended with Black Malvasia, 80/20 combination. Negroamaro is not just another fruity face, but also has some of the spice of Zinfandel and the silky smoothness of Pinot Noir. Oak Aging Recommended. Traditional Food Pairings: Grilled meats, on its own, pasta and full flavoured cheese. Petite Syrah occasionally produces strong, full-bodied red wines. More specifically, Petite Syrah creates dry, fruitier wines that are dark red in colour. In fact, this grape has a greatly tannic, fruity scent. Finally, winemakers usually age this wine for several months in order to enhance its aroma. Oak Aging Recommended. Traditional Food Pairings: Petite Syrah’s full-bodied characteristics allow it to be combined with more intense meals such as lamb and spicy pork. Pinot Noir is the most famous variety in France because of its great character and complexity. This grape is said to be one of the oldest cultivated varieties. Furthermore, this grape produces hearty, rich red wine that is smooth in flavour. Pinot Noir has a soft texture and is dark in colour. This great sipping wine is well liked by many winemakers because it ages superbly. Oak Aging Recommended. Traditional Food Pairings: Pinot Noir can match easily with some meat and fish dishes. To enjoy Pinot Noir with a delicious meal, chicken, rabbit, ham, roast beef, salmon and salmon trout would be good to try. Premium Red, also known as Red Bordeaux, is usually a blend of grapes – reds with reds. Premium Red is generally a blend of Cabernet Sauvignon and Merlot with quantities of Cabernet Franc and Malbec. This blend creates wines that are medium in colour with a clean, refreshing taste. This grape also produces wines that are rich with subtle fruit flavours. Finally, Premium Red can be enjoyed when it is young or when it has been aged for a few months. Oak Aging Recommended. Traditional Food Pairings: Premium Red can casually complete itself with help from different varieties of food and cheeses. Ruby Cabernet is the result of a combination between Carignane and Cabernet Sauvignon. This variety produces a good, dry wine that is medium red in colour. In addition, its full flavour makes it a well liked table wine. Traditional Food Pairings: Ruby Cabernet is known to many for complimenting the majority of strong, savoury dishes. Richer dishes that are also compatible with this wine are venison, duck and rich beef casseroles. Lighter meals can also be paired with Ruby Cabernet like fruit dishes or desserts with dark chocolate and berries. Sangiovese is one of those wines that people tend to overlook on the wine list. It is difficult to pronounce for the average lay person. The grape is believed to have its roots in Tuscany; however, it is grown intensively throughout Italy, where it is a dominant member of the Chianti family. For the winemaking process, the Sangiovese grape is typically blended with Cabernet Sauvignon and Merlot. Oak Aging Recommended. Traditional Food Pairings: ”Sangiovese is really a food wine.” The wine’s high acidity makes it a perfect partner for tomato-based pastas and pizzas. It goes very well with tomato based foods. It also goes well with cured meats, some fuller grilled fish, poultry, and veal. This red varietal is made from 70% Sangiovese and 30% Cabernet Sauvignon. The colour is a clear ruby red with pomegranate reflections. The aroma is complex and intense. There are also light touches of vanilla, a feeling of ripe fruit and spices. Oak Aging Recommended. Traditional Food Pairings: Sangiovese - Cabernet combines well with red meat, and especially with the traditional grilled duck and lamb. This super wine combines the full-bodied Merlot with the chic Sangiovese to produce a richly vibrant fruity wine. This deep ruby coloured wine delivers an intensely earthy taste that is balanced by a layer of dark plumy fruit, delicate hints of vanilla and well-integrated, modest tannins. Oak Aging Recommended. Traditional Food Pairings: It is ideal for a dinner party or relaxing with friends, the Sangiovese – Merlot is perfect with roasted meats and game. Shiraz has been cultivated in the Rhone valley of France where it is known for producing the best Australian wines. These wine grapes produce dark, rich and robust wines that are intense in colour and have a balanced character. In addition, the majority of wine makers enjoy Shiraz when it is young; however, it is thoroughly enjoyed when it has been aged for a few months. The choice of name forms the dividing line between the styles: Syrah is deep, austere, earthy and spicy, while Shiraz is richer, fruitier and more intense. Oak Aging Recommended. Traditional Food Pairings: Shiraz is usually complemented with food that has plenty of flavour. 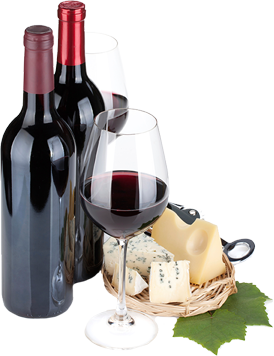 Barbecued food, turkey, lamb casseroles, chicken and cheddar cheese are foods that are usually enjoyed with Shiraz. Valpolicella, a lighter Italian-style red wine, is grown in the northeastern region of Veneto, Italy. This grape produces wines that are medium red in colour and rich in texture. More importantly, Valpolicella is known for its dry wines and fruity bouquets. In fact, Valpolicella is a splendid picnic wine that is thoroughly enjoyed when it is slightly chilled. Traditional Food Pairings: As a summer wine, Valpolicella is known to be served with bruschetta, light meats and Italian cheeses. Zinfandel is one of the most versatile wine grapes in the world. This wine grape in particular has been growing in California for the past 130 years. Because it produces medium to full-bodied red wines, Zinfandel is one of the most popular varieties for most winemakers. It is used to produce dry “blush” wines (White Zinfandel), fruity, easy-drinking wines and even classic, full-bodied wines that are medium red in colour. The aromas range from bright, juicy cherry and raspberry to deep, lush blackberry, blueberry and figs. Oak Aging Recommended. Optional: In Store Winemaking Price $88.00 + tax. Traditional Food Pairings: Zinfandel is occasionally complemented by many barbecued meats, roast chicken, pizza and pasta. Zinfandel/Shiraz is famous for its unusual blend of Zinfandel and Shiraz’s red-fruit flavours. In addition, this wine consists of many fresh fruit, raspberry and cranberry aromas. Zinfandel/Shiraz satisfies the palate with its flavours of leather and blueberry. Oak Aging Recommended. Traditional Food Pairings: Zinfandel/Shiraz can be greatly enjoyed when it is paired with watermelon, prosciutto, lobster, poached salmon and salad.